Preparing a Small Estate Affidavit in Rhode Island is a beneficial way to administer the estate of a deceased person without having to go through the long, drawn out process of probate court proceedings. The use of a Small Estate Affidavit for Rhode Island is limited to situations where the deceased person did not have a lot of assets. To qualify in Rhode Island, the estate in question must be valued below $15,000. Also, this simplified process entitles the executor of the document to receive possession and ownership of the deceased person’s property without having to go through the formality of probate. The person completing the Small Estate Affidavit Rhode Island form must also swear to make proper notice to other claimants, if any. Fill out and print a free Rhode Island Small Estate Affidavit form in just minutes online. While the major legal requirement for utilizing a Small Estate Affidavit in Rhode Island is the total worth of the decedent’s property, there are a number of factors you should consider to ensure that the estate administration goes as smoothly as possible. The Small Estate Administration process in Rhode Island is started when the affiant makes the application at the appropriate local court in Rhode Island where the decedent passed. The appropriate court may be a surrogate’s court, probate court or circuit court, whichever is responsible for probate matters where the person died in Rhode Island and the estate is located. There is usually a waiting period of about 45 days before Small Estate proceedings in Rhode Island can be started, however, the court may waive the waiting period with good cause. Sometimes a Rhode Island Small Estate Affidavit might not be the right course of action, depending on the deceased person’s assets and the conditions of their financial health. Once you have filled out the Rhode Island Small Estate Affidavit form completely, it must be sworn and signed in the presence of a local notary public. A certified copy of the death certificate is also required to be filed along with the Small Estate Affidavit in Rhode Island. The death certificate can be obtained from the local health department for a nominal fee. After the Rhode Island Small Estate Affidavit has been filed, the normal court process for Small Estate Administration takes place, with the affiant receiving the court’s permission to take over the estate, taking into consideration the provisions of the law with regards to creditors as well as court costs and other expenses. After satisfying all claims, the estate’s assets can then be distributed, either in accordance with the will, or with the laws of intestacy, when there is no will. 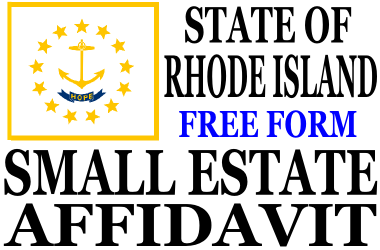 Fill out and print a free Small Estate Affidavit form for Rhode Island in just minutes online.